I like to cook (a lot), but I love to bake. It’s true that I have an affinity for carbs in all forms, being able to whip up breads, cookies, and such is not the only reason I prefer baking. My perfectionist leanings thrive within the confines of a recipe. Where cooking is Picasso, baking is paint-by-numbers. I like paint-by-numbers. Which is why I rarely deviate from a recipe. But some recipes just cry out to be adapted and made multiple different ways. I felt that way with homemade Clif Bars. Even though I only posted the Cinnamon Golden Raisin variety, I never made them the same way twice. There was a Chocolate Chip Coconut and a Trail Mix version, too. These Oat Bars are the same way. I found the recipe on Pinterest, made it as per the recipe once, and then kept thinking of different flavor ideas. The bones of these oat bars are a nutrient rich combination of rolled oats, whole wheat flour, and milk (of any sort). The need for butter in the original is eliminated by using unsweetened applesauce. They are sweetened with honey, making them perfect for No Sugar September and why I even found the recipe in the first place. Sidenote: Carrot puree is super easy to make (peel, chop, and boil two large carrots and then blend in a food processor), but I’d imagine canned pumpkin would be a great substitute in this recipe. My mind immediately went to carrot cake (because I’ve been sugar deprived, perhaps?) and I played off the flavors and mix-ins that are traditionally found in carrot cake – cinnamon, nuts, and raisins. Now that I think of it, crushed pineapple would be a tasty addition, too, but that’s getting into Hummingbird territory and we can’t mix cakes now can we. The end result of all this carrot oatiness is a dense, filling bar that is perfect to pack in a lunch, tuck in a carry on, or nibble on throughout the day. I’ve enjoyed mine with a slice of cheese or scoop of apple butter and a glass of milk. Tim takes them to work for an afternoon snack. They’d be amazing for a newly nursing mom who is in that eat everything, always hungry stage. If you were wanting to make these a little desserty and still keep them refined sugar free, blend cream cheese and maple syrup together to spread on top and cut into squares. And because I kept thinking of ways to adapt the original, I’ve got a Chocolate Peanut Butter version coming atcha soon. In the meantime, enjoy some Carrot Cake! A nutrient rich, filling snack bar with no refined sugar. Enjoy them plain, with apple butter, cheese, or a little cream cheese/maple syrup frosting. Lightly coat an 8 x 8 inch baking pan with cooking spray and set aside. In a saucepan over medium heat, whisk milk, carrot puree, honey, egg, and vanilla until the honey is melted and all the ingredients are combined. It will be a lovely shade of peach! Pour the liquid ingredients into the dry ingredients and stir until combined. Put batter in prepared pan. Bake for 35 minutes or until a toothpick comes out clean. Any variety of milk or milk substitute will work. [br]I use an old fashioned nut grinder to get an even fine chop on my walnuts. [br]Pecans or almonds would be nice, too. [br]If you don’t have allspice, use 1/2 teaspoon of nutmeg. [br]You could totally use currants or golden raisins instead of raisins. I feel the same way about my hair color. B-l-o-n-d looks dreadful and brusque, but b-l-o-n-d-e looks so much more distinguished and elegant. Either way you spell it, blonde carries a heavy weight around on its pretty shoulders. Blonde has a reputation for being light, airy, and shallow. But we all know plenty exceptions to the blonde stereotype, right? For example, this granola. It’s light. It’s easy. But this Blonde also has substance and flavor that goes beyond its small ingredient list and fair exterior. Now, I’m a huge granola fan, and in no way against the CrunchyPecanPumpkinFlaxWhiteChocolatePeanutButterRaisin type of granola. However, for my daily granola habit, I needed to exercise some restraint. And when we went sugar-free, I made a handful of not-so-delicious granolas that prompted me to create an everyday granola of my own with no refined sugar and a whole lot of flavor. I stripped down my Gingerbread Granola to make this simple blonde version. You won’t find spices or brown sugar vying for your taste bud’s attention (or making your granola the more traditional brunette). It’s just old-fashioned rolled oats and sliced almonds getting a simple wash of maple syrup, coconut oil, and salt before spending some time under the dryer (um, in the oven). The result is a pure granola goodness. Don’t skip out on the salt. It lends a kettle corn, sweet caramely quality to the granola that is positively addictive. I’ve been enjoying mine on homemade pumpkin yogurt. Line a baking sheet (preferably one with sides) with parchment paper or a silicone baking mat. In a large bowl combine oats, almonds, and salt. In a saucepan over medium heat, stir together maple syrup and coconut oil. Continue stirring until coconut oil is melted and fully incorporated with syrup. Pour over oat mixture and mix until all dry ingredients are moistened. Spread moistened mixture on prepared pan. Cook for 1 hour and 15 minutes, stirring two or three times throughout the baking process. Remove from oven and let cool completely before storing in an airtight container. When you’re a sweet toothed, carb addict who is trying to make wise food choices, low-fat and cake in the same recipe is a beautiful partnership. My mom had already vetted a couple muffin recipes from the Moosewood Restaurant Low-Fat Favorites cookbook I talked about in this month’s Twitterature post, so we were intrigued by the banana cake that fit that glorious description. Many things can go wrong with low-fat baked goods. Some aren’t sweet enough (for me), others have a weird texture due to reduced amounts of butter and/or eggs. Some just have that “too-healthy” stank on them. But this dense, flavorful cake? None of the above. Bananas and unsweetened applesauce add moistness to balance the reduced oil content. Brown sugar’s molasses undertones provide strong flavor and just enough sweetness to make this a viable dessert. The whipped egg white to egg yolk ration is perfect, cutting out some cholesterol while still maintaining a tight, rich crumb. I’m a sucker for anything with nutmeg (homey and festive, right? ), and I loved how the unexpected spice in this cake made the banana flavor more complex. The recipe calls for baking in a Bundt pan (which is how I baked it), but my mom has made it twice in a 9-inch springform with great results. Slices of any shape are perfect for tucking into lunch boxes or nibbling on in the afternoon. I love mine with a plop of peanut butter and a cup of tea in the morning. But, it is a cake, so we’ve served it with a cloud of lightly sweetened whipped cream to rave reviews. I can also envision it with a dusting of powdered sugar and berries or a drizzle of homemade caramel sauce. Whatever way you serve it, this Low-Fat Banana Bundt Cake is worth having in your banana repertoire. As with most banana baked goods, it tastes even better then next day. Unless your family eats a lot of unsweetened applesauce, buy a pack of the individual snack sized applesauces. You’ll have enough to make three cakes without worrying about the applesauce spoiling. Buy overly ripe bananas instead of waiting for regular ones to get hinky. Grocery stores sell bags of brown bananas for cheap. You can even freeze mashed banana to use later (which is what you see in the photo of ingredients above). Do you have a favorite banana baked good recipe? A dense and delicious banana cake for anytime of day! Adapted from Moosewood Restaurant Low-Fat Favorites: Flavorful Recipes For Healthful Meals. Lightly coat a 10-inch Bundt pan (or 9-inch springform) with cooking spray. In a large mixing bowl, stir together the flour, baking powder, salt, nutmeg, and brown sugar. Mix well and set aside. Combine the egg yolks, bananas, applesauce, oil, and vanilla. Add the banana mixture to the dry ingredients and stir just until evenly blended. Beat the egg whites until stiff but not dry. Gently fold the egg whites into the banana batter with a spatula. Pour into prepared pan. Bake for 60 minutes, until the cake begins to pull away from the sides of the pan and a knife inserted into the center comes out clean. Cool on rack for 10 minutes and then invert onto a plate. 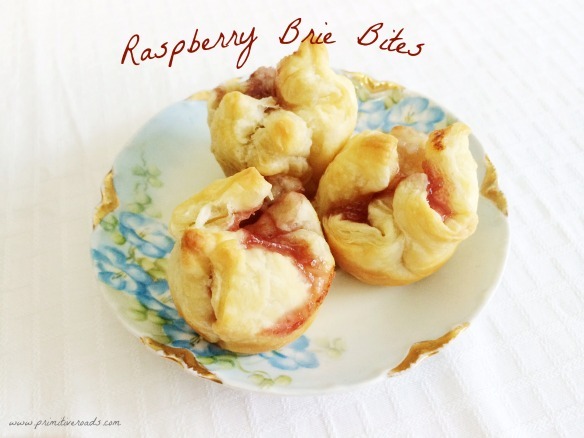 I wish I could take credit for these Raspberry Brie Bites, but they were the brain child of my sweet friend Christie. She made them for a Fall party in 2011, which ended up to be the day before Tim and I got engaged! (That’s her on my right (below), holding the apple…). She makes some of the most delicious little appetizers and these are no exception. 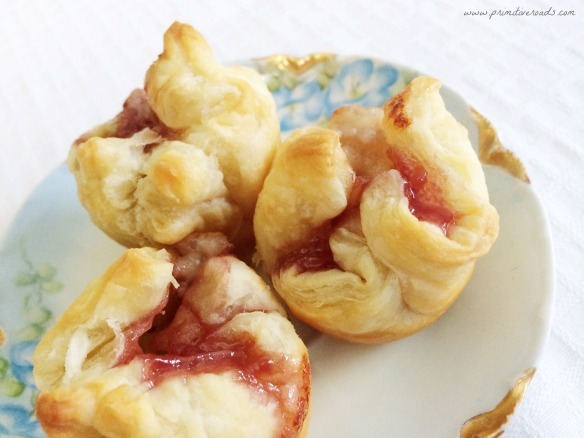 After having them at that party two years ago, Tim and I have made these jammy, cheesy puffs a dozen times, especially during the holidays. The recipe is really straightforward, but this simple combination of flavors is addicting. Plus, they’re just cute. They remind me of mini brie en croutes with a sweet touch from the jam. Three ingredients and ten minutes later Raspberry Brie Bites are in the oven. By the time you tidy up the kitchen, the bites are golden and bubbling. Once you start making them, you’ll think of endless variations. I LOVE Brie, but you could sub any soft cheese. Cream cheese would be great, as would gorgonzola for a more savory bite. Same goes with the jam. Try fig preserves, blackberry jam, or a chutney of some sort. If time had allowed yesterday, I would have fried up some bacon to crumble inside this batch. Preheat oven to 400 degrees. Lightly grease a mini muffin tin or two. Let the puff pastry thaw in the refrigerator (great) or countertop (good) until the sheets are workable but still cold. One sheet at a time, unfold the pastry and lay flat on a lightly floured surface. Roll the pastry sheet out until the folds are smooth and the sheet has stretched a bit. You don’t have to be exact. Cut the sheet into 12 pieces. 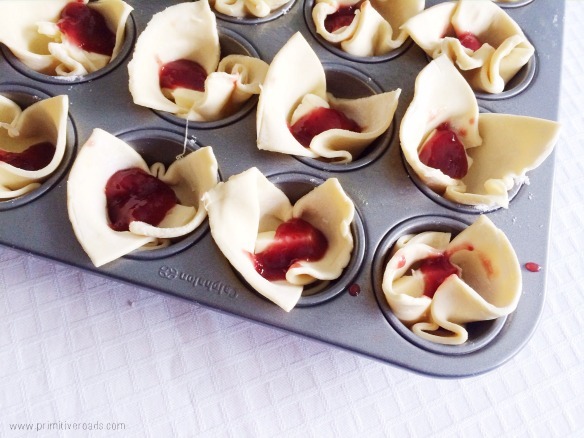 Line muffin cups with the pastry pieces. Repeat with the second sheet so you have 24 all together. Trim the rind off of the Brie and cut into small chunks. Mine end up being 1/2″ cubes. 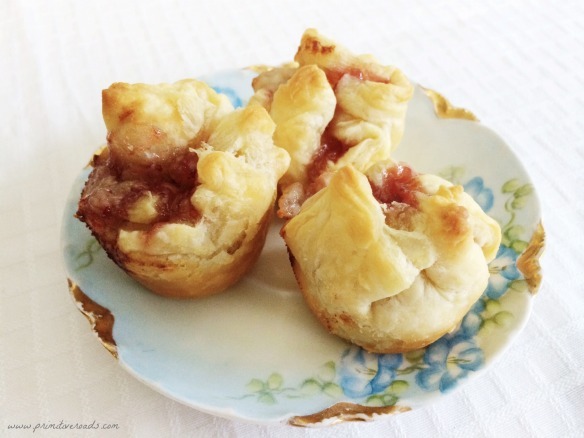 Place one chunk of brie in each pastry cup. Drop a teaspoon of jam into each cup. Now comes the fun part! 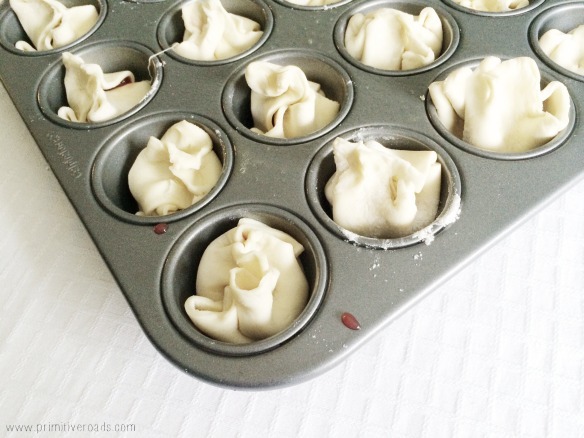 Squeeze the tops of the pastry together to create little packages. Bake the bites for 20-25 minutes or until just golden. Let them cool in the pan for 5 minutes and then take the bites out. Eat warm or at room temperature. We’ve never had any leftover so I can’t vouch for how they weather an overnighter.